After wowing us with his gorgeous (and still unreleased) graphics mod for Grand Theft Auto V, Martin Bergman applies his Toddyhancer tweaks to Star Wars: Battlefront with ridiculous results. 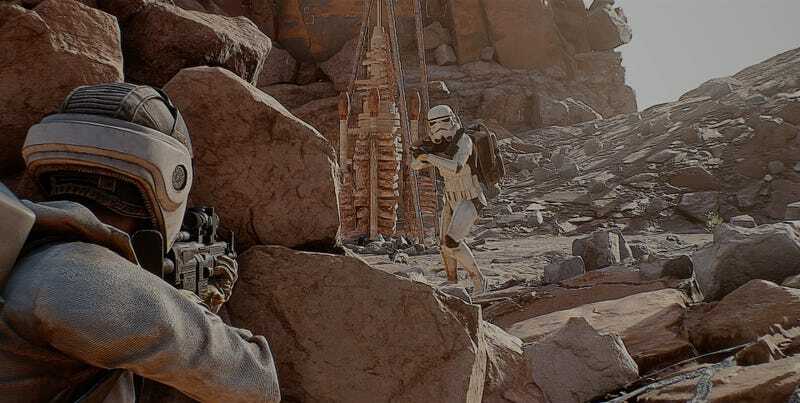 The Tatooine survival mission in Star Wars: Battlefront isn’t too hard on the eyes in its unaltered form. But once Bergman applies his signature mix of reshade shaders, enhanced natural bloom and other visual tweaks, it looks like real life. It’s as if someone got a bunch of cosplayers together in a desert and took pictures of them LARPing. At least until the AT-ST shows up. So when can we expect these gorgeous visuals to be available to the public? I wouldn’t hold my breath. So far all we’ve seen is the Tatooine survival mission, which is very pretty but relatively uniform in composition. I want see what he can do with Endor. Plus, as Bergman points out in his extensive imgur gallery, the current build of the MOD drops the game’s frame rate by 30-40 FPS, so unless you’re keen on taking screens it’s not all that practical. Perhaps it’s better to just look for now. Hit up Bergman’s imgur post for a ton of screens of dead stormtroopers.